Our selection of products is designed to protect, moisturize and nourish NORMAL skin types. Includes Day Gel, Facial Renourisher and Hydrosol. 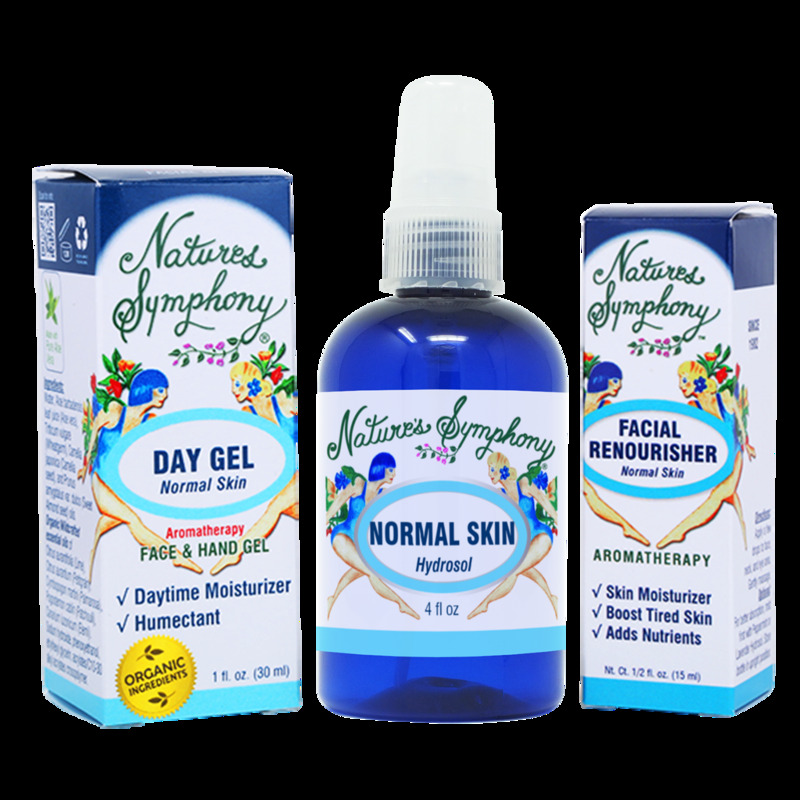 Day Gel (Normal Skin): All natural blend of moisturizers and skin protectors for normal skin types. Contains Aloe Vera gel, Wheatgerm, Camellia, and Sweet Almond fixed oils, along with pure organic essential oils of Lime, Elemi, Palmarosa, Patchouli, and Petigrain. Facial Renourisher (Normal Skin): Using the proper oils can help control the production of sebum and balance your skin. Our blend includes the fixed oils of Sweet Almond, Fractionated Coconut, and Jojoba along with the pure organic essential oils of Lavender, Rosewood, Sandalwood, Patchouli, Petitgrain, and Neroli. For best results, mist your face first with Normal Skin Hydrosol and apply only a few drops of this concentrated blend of precious and nourishing oils at bed time. Hydrosol (Normal Skin): A gentler alternative to essential oils that renourish and hydrate your face and body. Mist face and body after cleansing or use to refresh during the day or before applying Facial Renourisher. Contains the distillation water from the aromatic plants of Peppermint, Lavender and Rosemary.